When the Ram was honored, a banner went up at headquarters. Feel-good moments are hard to come by at Chrysler, which is slogging through a product drought until a new Grand Cherokee arrives in June and new models from Fiat start arriving in late 2011. So it felt mighty good back in December when Motor Trend named the Dodge Ram 2500 HD its 2010 Truck of the Year. 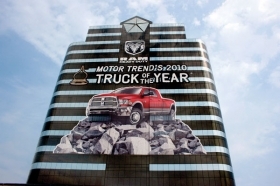 Chrysler covered its headquarters in Auburn Hills, Mich., with a banner visible for miles around. The award is the centerpiece of Ram's ad campaign, too. In the June issue, the magazine's editors decided to see how their Truck of the Year compared with the new kid on the block: the 2011 Ford F-250 Super Duty. In a side-by-side comparison test, the Ram finished second in a close race. Motor Trend praised both trucks. The Ram earned kudos for its powerful Cummins diesel engine, its lower price, its interior and its new exterior design. The Ram is "still the commercial-grade workhorse of the bunch, but the rough edges are beginning to show," the magazine concludes. The big Ford gets high marks for its fuel economy when towing, superior refinement, smoothness and a long list of features. The editors wrote: "Ford's engineers have given the segment a huge push forward in quality and refinement with a high-tech powertrain that forces the other guys to work harder if they want to keep playing in the work-truck arena."